I follow by bookmarking primarily, with twitter and other folks blogrolls as minor tools. I love to comment and discuss the posts of many of you, however, you MUST change your settings to allow those of us without blogger to comment. How you ask? Make sure you allow people to “comment as” a Name/URL. Look below where you see the drop down here on AAI’s page. See the Name/URL? Make sure your site allows this. There are several, especially in the DG community (which loves blogger) that doesn’t allow this. If this is you, fix it! I want to comment on your blogs! Thanks for your input. I haven’t noticed that about other blogs but I’m also using blogger so that’s why. I’d like to make my site more user friendly so I’m trying to get any feedback I can. Hi AAI. I also add the blogs to my reading list. I usually have the list set to private and follow along for a few weeks. If a blog keeps generating unique material, I add it to my Blog Roll. I am interested in wordpress based blogs, because I’m thinking I’ll convert my blogs over soon. Do you know if they have a reading list plugin? They seem to have a plugin for about anything. I noticed the ability to set to private but haven’t used that, I wasn’t sure of the benefit? I’ve noticed some really cool WordPress blogs. I’m curious what the reason is that you are wanting to switch? Unfortunately, I don’t know if they have a reading list but would like to know myself. You do need to host your own blog to use WordPress if I’m not mistaken. That’s probably a big draw to blogger for the free hosting. I own my own site but am still letting Google host the content. The biggest issue with the free hosting with Google is that they technically own your content (if I’m not mistaken). For that reason, I chose WordPress when I started, even though I am required to pay for hosting with a third party. 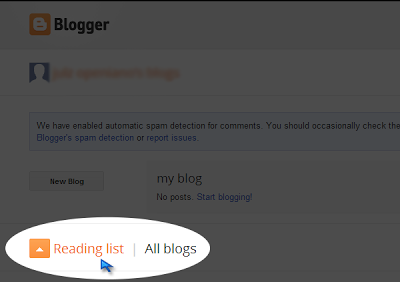 I generally bookmark as well, but also use the “recently updated” function a lot of bloggers implement on their site. This lets me know which sites have new content. As writing2reality noted, there a a few quality dividend blogger sites that unfortunately don’t make it easy to comment on. Not sure why Blogger does this by default, but I hope everyone who hasn’t done so gets it fixed! I do use bookmarks but I follow a lot of sites so I want to see the most recent content. That’s why I follow on a reading list. “My Blog List” on the side of the page is basically a recently updated function like you are talking about. I’m glad nobody has an issue commenting here. I changed the settings a while back. I use a split screen with IE and Chrome at work. I just added that app you mentioned and will try it out. Thanks for sharing. You are going to like it. Also make sure to download the app for your phone. It will auto sync. I created category. For example, Dividend Blogs, Saving Blogs, and Cisco/IT Blogs (I am in the IT field). Thanks for the tips. I’m going to try it out. I just downloaded it on my Android phone. I’m surprised to see all the people using bookmarks or platform specific reading lists. For bookmarks, how do you remember where exactly you left off? How can you tell when there are new posts – just keep checking back on every single site constantly? For those using Blogger’s reading list, how do you follow blogs that aren’t on the blogger platform? RSS was invented for exactly this purpose and is supported by every financial blog I’ve found, so a +1 for Feedly as the backend. Use whatever app you like to read from Feedly. Nextgen Reader for Windows & Windows Phone, Reeder for iOS or Mac, or just the Feedly mobile app itself. You can enter any website into that Blogger reading list. I have many websites that are WordPress and it keeps them all updated just fine. I am checking out Feedly to see if I like it better though. Thanks for sharing. I’m checking out Feedly now as many are already using it. Being lazy, I just go to my own blog and peruse the “My Blog List” section for recent updates. Easy! You don’t even have to log in if you don’t want to…just use a bookmark to your own page and you’re done. I also do this as well as go to my reading list. I’m going to try out Feedly to see if I like it any better that what I’m currently doing. Also use Feedly and the app. Love it! I feel left out as many of you are already using Feedly. I’m checking it out now. Nice tip. I use RSS reader (RSSOwl) where I have a list of my favorite blogs and some I already have in my blogroll too, but primarily I use RSS reader. During the day I do not have time to read only in the evenings and with the reader I can see who uploaded a new content and how many articles. Sometimes I am unable to keep up reading. It does become difficult to keep up with all the new blogs and daily content out there. I’m going to check out some of the recommendations here. Probably old fashioned here but I stick to bookmarks. I can change the priority of them easily and I can skip the spam hit generating blogs that do daily or multiple posts a day and catch up later. Thanks for sharing what you use. It’s always nice to see what others are doing and to get new ideas.